Cet article analyse la lecture/mise en scène d’Édouard III au Teatro espagnol de Madrid le 5 juillet 2005, dirigée par Juan Antonio Hormigón dans une traduction espagnole d’Antonio Ballesteros-González. Hormigon y fait une réflexion sur le pouvoir et les désastres de la guerre, en s’appuyant sur la thématique, la rhétorique, l’idéologie et la théâtralité de la pièce. 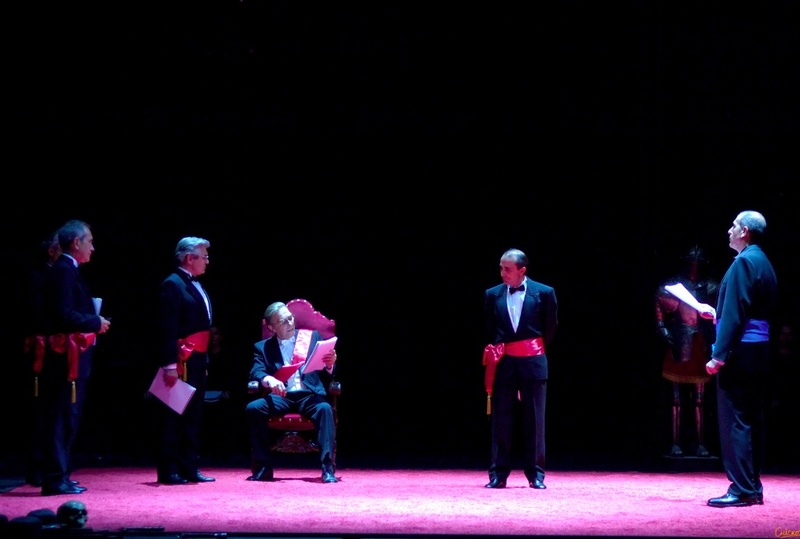 This article aims at analyzing the Spanish text and the one-day performance of King Edward III in the Teatro Español in Madrid on July 5, 2005. The play was translated by Antonio Ballesteros-González and directed by Juan Antonio Hormigón. Hormigon’s "dramatization" emphasized the representation of royal power and war disasters in the Elizabethan play, paying special attention to specific thematic, ideological, rhetorical and theatrical features of the play as it was performed on the stage. 1The Reign of King Edward III was an unheard of play in Spain until the year 2005, when I edited and translated it at the request of Juan Antonio Hormigón, Secretary of the Spanish Association of Stage Directors (ADE), who was aware that the play had been performed by the Royal Shakespeare Company in 2002.1 As I had previously collaborated with the ADE on several editions and translations of English Renaissance and Restoration plays unknown in Spain, Hormigón contacted me and I enthusiastically accepted his proposal. So far, the only existing edition of the play recently restored to the Shakespearean canon after no small academic controversy was that of Giorgio Melchiori. After incorporating it in the third volume of his annotated edition of Shakespeare’s plays,2 he edited the play for The New Cambridge Shakespeare series in 1998,3 two years after Eric Sams’ edition for Yale University Press.4 The play was included in the 2005 edition of the Oxford volume of the Complete Works of William Shakespeare, and Richard Proudfoot is currently editing it for The Arden Shakespeare Series. In the meantime, the debate about the play was renewed by the stylometric study of Brian Vickers (2009). Using a computer program called Pl@giarism, initially developed to detect student plagiarism, Vickers concluded that the text was the product of the collaboration between Thomas Kyd (60%) and Shakespeare (40%).5 Together with the successful performance of the play in Romania,6 this proves that Edward III, Shakespeare’s or not Shakespeare’s, is alive and kicking. And it deserves to be so for the intrinsic qualities of the play. 2Editing and translating Edward III was a challenge. I tried to be faithful to the language and the spirit of the play, choosing, as I had done for other translations of Elizabethan, Jacobean and Restoration works, the powerful, flexible diction of the Spanish Golden Age theatre, which, to my mind, constitutes the perfect paradigm for its English dramatic equivalents. At the time, I was more of an iconoclast than I am today, and I passionately defended “the case for Shakespeare”, as Eric Sams puts it, while taking into account the readings and analyses of Melchiori, Proudfoot, and Tillyard among others.7 Convinced that the publication of the first Spanish translation of a play partly or entirely attributed to Shakespeare was a special occasion, Juan Antonio Hormigón accompanied the book presentation with a performance or more exactly a “dramatization”—a dramatized reading—of the play. He had assembled a brilliant cast of old and young players, some of them well known to Spanish theatregoers. It seemed a good decision to bring together several generations of stage actors not brought to fame by television series as is the norm in theatrical planning in Spain today to attract audiences. 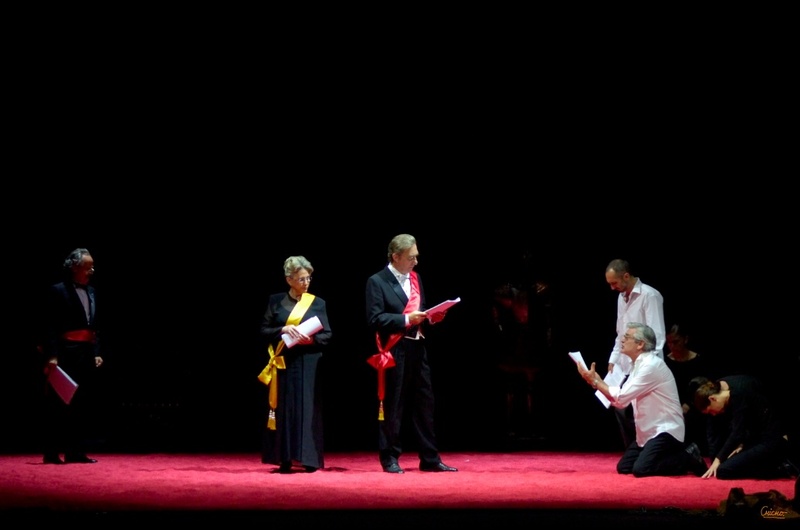 This one performance took place on July 5, 2005 at the Teatro Español, the oldest playhouse in Madrid, between the end of a Shakespeare festival and the premiere of a production of Eugene O’Neill’s Mourning Becomes Electra. The performance of a “new” Shakespeare play on the stage of a major playhouse however failed to attract media attention, and there are few records of this dramatized reading. My purpose here is to provide an account of this Spanish premiere of Edward III, paying special attention to some of its theatrical, thematic and ideological implications. Citizens listening to the Second Frenchman (Mario Gas, director of the Teatro Español, speaking from above) (III.ii). 3Juan Antonio Hormigón conceived the play as a fully contemporary text, where however what Jan Kott called “the Grand Mechanism” of the feudal order was still patent.8 On the face of it, Edward III is a text in praise of the English monarchy after the defeat of the Spanish Armada in 1588, an apology of war as an instrument of royal power. Hormigón emphasized its patriotic flavour even as he denounced the bloody enterprise of the English king who “made his dominions bigger, although one wonders at what price”.9Edward III is a text in which the conflict between love and honour is resolved in favour of honour. The king and his courtiers, like their French counterparts, are professionals of war who base their power on the rules of chivalry spuriously used to accumulate riches and territories. However, Hormigón fully exploited the ambivalence of the play, counterpointing the celebration of war with episodes in which representatives of the common people appear on the stage, revealed as the real victims of the ambitions of political powers. Hormigón meant this production as a critique of the aberration of war. His main target was George Bush, then engaged in a conflict with Iraq, though he was never explicitly mentioned for the sake of a-temporality and universal anti-war symbolism. 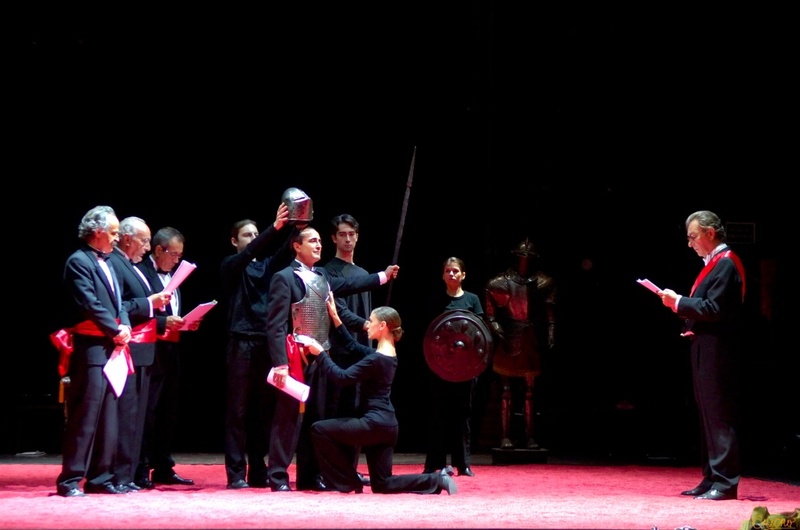 The prince is given his arms, a significant ritual in the play (III.iii). 4Still, one must consider that Edward III and the Black Prince were iconic figures when the play was first performed for an Elizabethan audience. Hormigón shared my view that the play’s nostalgia contains ambiguous undertones. It gave its original audience an opportunity to celebrate the powerful monarch who established the Order of the Garter and provided glory to the country through his exploits in France during the Hundred Years War, and the heroic figure of the Black Prince, solemnly knighted on the stage—an essential moment in a play that is very much concerned with rituals. They must have shared a tinge of nostalgia on seeing the venerated prince return triumphant from the battles of Crecy and Poitiers, a successful element of dramatic suspense. 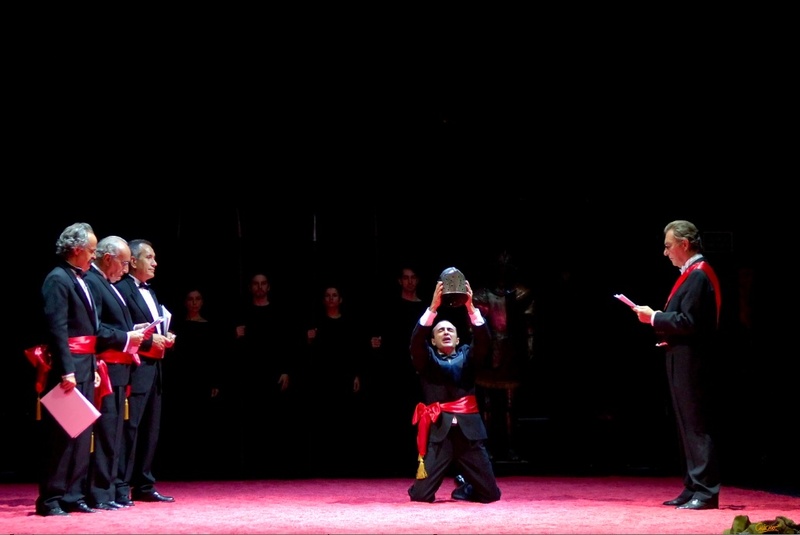 The ritual scenes of the arming and the knighting of the Prince in Hormigón’s production were vividly performed, creating an evocative dramatic effect for the spectators who crowded the Teatro Español. 5Yet, though the original audience was probably ignorant of the catastrophic consequences to the kingdom of the policy of these two pernicious spendthrifts, they must have been dimly aware that the prolonged slaughter of the Hundred Years War ultimately culminated in the Wars of the Roses. 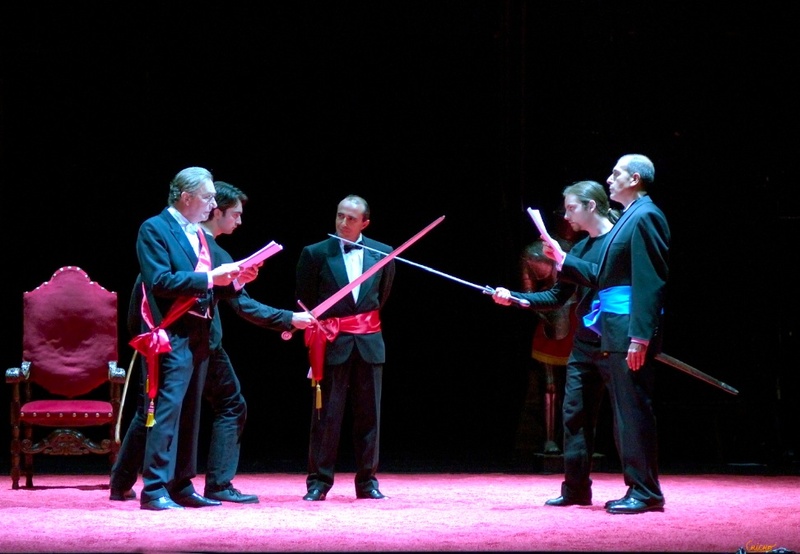 There is undoubtedly a high degree of brutal and un-chivalric behaviour in Edward III, which was duly stressed in Hormigón’s production, where the stage was mainly occupied by a square of red sand evocative of blood. 6The designer of the original set, Tomás Adrián, also tried to emulate the atmosphere of an Elizabethan playhouse in the midst of what was an Italian stage. The space adjacent to the red square was occupied by two rows of seats on either side where the players would sit when not acting, turning into spectators in a fine metadramatic effect. The stage with red square and actors seated on both wings. The English courtiers wear red sashes. And scatters it in the middle of the air. Until their lofty tops were seen no more (3.1.161-171). Swords represent the struggle between England (King Edward) and France (Lorraine). Most verbal violence and warlike imagery in Edward III comes from the performance of kings and princes themselves caught in the fascination of war. 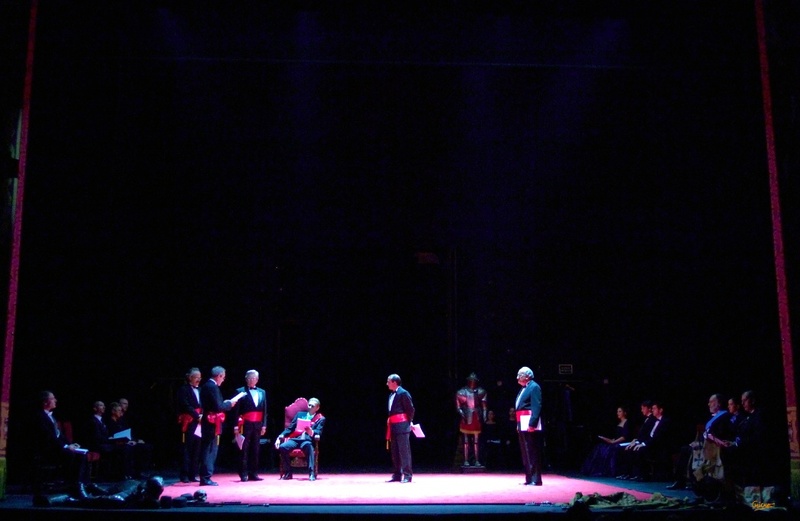 In Hormigón’s production, actors were smartly dressed in dinner jackets, the English and the French identifiable by the colour of their sashes, red for the former, blue for the latter. The Scots sported striped sashes and Queen Philippa’s was golden. Apart from suggesting a modern perspective, the Spanish director, as he told the cast in rehearsal, wished to emphasize that even brutal tyrants dress impeccably, while behaving in despicable, Machiavellian ways. Confrontation between the English (red sashes) and Lorraine (blue). Edward III sits on his red throne, a symbol of royal power. A suit of armour is visible backstage. When Ave Caesar they pronounce aloud. The prince holds the helmet above his head in a clear representation of political power. There are many such occasions in the play in which honour and war are interrelated, and they are faithfully represented in Hormigón’s dramatization. Even from a metaphorical viewpoint, the courting of the Countess by Edward is perceived as another war episode, although honour and war patently diverge here.The king wants to conquer the body of the beautiful lady without her consent and despite the impediment of her marriage, breaking all the laws of chivalrous and honorable behaviour. Power is exerted through (in this case sexual) violence. The Countess and her castle of Roxborough—body and land—are inextricably connected, as shown in her soliloquy in 1.2 and the subsequent dialogue between the Scots, David and Douglas. The Countess besieged, imprisoned by swords (I.ii). 7Edward transforms his territorial war founded on lineage into an internal battle of sexual desire that is just as extreme and excessive, as is evident from Edward’s words to the Countess in their first encounter: “Lady, stand up; I come to bring thee peace,/ However thereby I have purchased war” (1.2.113-114). The King’s Scottish wars are soon replaced by the sexual combat brought about by his inordinate passion. Even the fair Countess speaks eloquently of war: “When she would talk of peace, methinks her tongue/ Commanded war to prison; when of war,/ It wakened Caesar from his Roman grave/ To hear war beautified by her discourse” (2.1.36-40). Edward underlines the military metaphor when trying to persuade Warwick into becoming his ally: “Here comes her father: I will work with him/ To bear my colours in this field of love” (2.1.294-295). The Countess’s response to her father’s discourse is phrased in military metaphors: “Unnatural besiege! Woe me unhappy,/ To have escaped the danger of my foes/ And to be ten times worse envired by friends!” (2.1.413-415). On the whole, the “thrice gracious” (2.1.190) and “thrice gentle” (2.1.202) monarch becomes, in the Countess’s words, a fearful tyrant who does not respect the codes of chivalry, supported by oaths of honour, that he represents. Warwick and the Countess (II.i). 8The different registers of the character were brilliantly performed by Hector Colomé as the English monarch. Edward turns to Petrarchan paradoxes and conceits to describe himself as the Countess’s vassal, inverting the social scale: “She is an imperator over me, and I to her/ Am as a kneeling vassal, that observes/ The pleasure or displeasure of her eye” (2.2.40-42). Their confrontation in 2.2.61 et passim, full of sexual connotations, is a military encounter, a conventional device of Petrarchan sonnets, the poetic trend that Lodowick imitates with his shallow rhetoric. Edward III and Lodowick (II.i). 10None of the royal characters really care about the fate of their subjects, compelled to endure the whims, ambitions, pride, and political interests of their “betters”. These ambiguities are presented with great dramatic force on three occasions. One is the appearance of the French citizens after Sluys (3.2), another is the episode of the six poor Frenchmen in act 4 scene 2, in which Edward shows that he can be merciful. The last but by no means the least is the episode of the six burgesses of Calais (5.1.8), in which the compassion and pragmatism of Queen Philippa is effectively manifested. The burghers of Calais and the merciful intercession of Queen Philippa. These moments contain revolutionary echoes, in response to the world of courtly splendor and the tyrannical procedures of rulers governing under the premises of egotism and despotism. 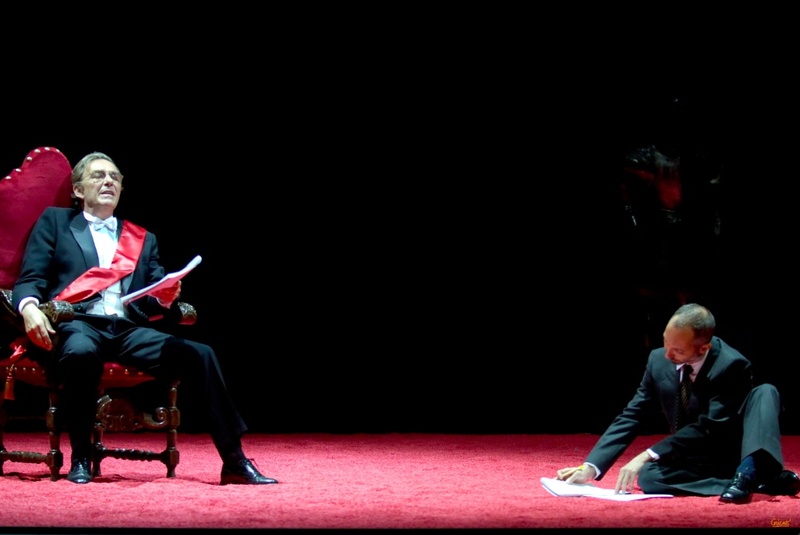 Deliberately staged in a Brechtian fashion, they made for especially moving scenes in Juan Antonio Hormigón’s production, gesturing to other scenes where Brecht portrays the conflict between power and submission, and the vulnerability and defenselessness of the representatives of the lower social order. The citizens (III.ii) in Brechtian tableaux. The music of Dmitri Shostakovich permeated the dramatic structure of Edward III from the beginning, contributing to its succession of climaxes and anti-climaxes. Aural effects like military sounds and the cawing of ravens played a significant part in an otherwise austere, restrained soundtrack selected by Ignacio García. The interventions of citizens were always preceded by the same sound-effect, the crying of a baby, a leitmotiv heralding the cyclical reiteration of pain and suffering. In general terms, sounds (alarums, the storm, the rumour of the sea, echoes from the underworld…) had the movement of a pendulum, now coming from the front, now from the back and vice versa, vanishing in a gradual manner. As Hormigón explains,11 both he and Ignacio García chose the music of Shostakovich for it “permitted us to flee from any superficial sentimentalism or soporific atmosphere. The predominance of metals and percussion, the rotund rhythms and the medium volume avoided all kind of idle inclination to mental drowsiness, which is undoubtedly the most serious type of lethargy”. In general terms, the diversity of Shostakovich’s music contributed to mark the semantic nuances of the plot. 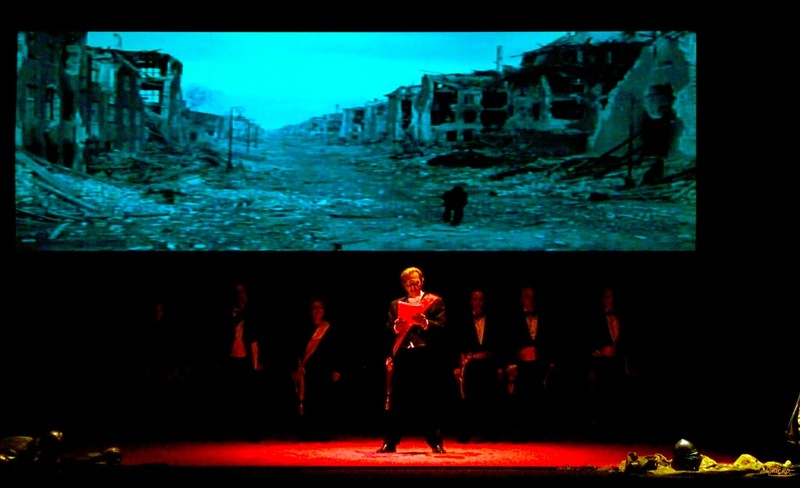 11Perhaps Hormigón’s most relevant contribution to the play as visual spectacle was the projection of cuts from films, documentaries, and television series dealing with war disasters on a screen overhead, while the Black Prince and King Edward triumphantly spoke the final lines of the play in an intense red light, a wise move by the technician Francisco Ariza. The audience could simultaneously see extracts from the BBC version of War and Peace, Polanski’s The Pianist, images of the devastation of Hiroshima, the war of Vietnam, the withdrawal of Nazi troops in Crimea at the end of World War II, and, finally, the expressionless face of a girl looking at the camera, probably asking “WHY?”. The play’s ending: the proud words of King Edward are counterpointed by filmed images of the horrors of war. 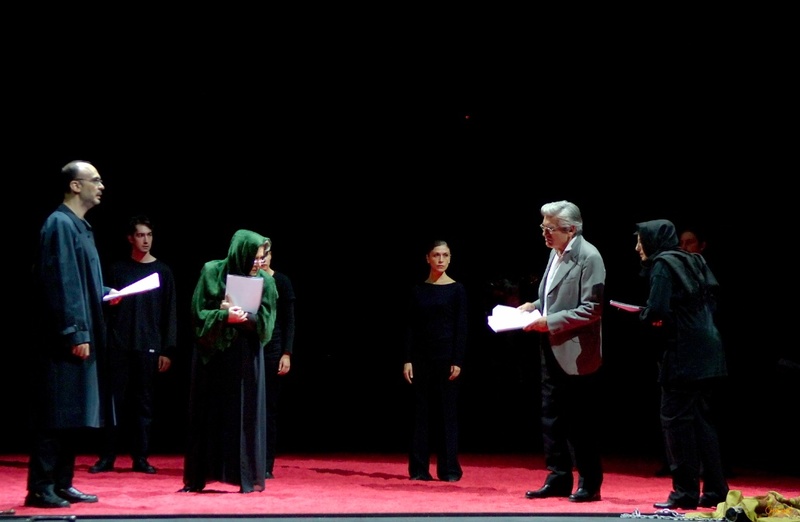 These images were a powerful counterpoint to the play’s apology of war, deconstructing it in keeping with the pacifist message Hormigón wanted to convey to the audience in the wake of the Iraq war. The audience’s response was enthusiastic and the performance was a good example of how enthralling and dramatically appealing The Reign of King Edward III can be for contemporary audiences. Ballesteros González, Antonio, ed. and transl. Eduardo III. Madrid: Asociación de Directores de Escena de España, 2005. Hormigón, Juan Antonio. “Un reto apasionante: Eduardo III de Shakespeare”. ADE Teatro 107 (October 2005): 20-42. Melchiori, Giorgio, ed. Teatro completo di William Shakespeare, IX. I drammi storici, vol. III. Roma, 1991. Melchiori, Giorgio, ed. King Edward III. Cambridge: Cambridge University Press (The New Cambridge Shakespeare), 1998. Proudfoot, Richard. “The Reign of King Richard III and Shakespeare”. Proceedings of the British Academy 71 (1985): 159-85. Sams, Eric, ed. Shakespeare’s Edward III. New Haven: Yale University Press, 1996. Tillyard, E. M. W.: Shakespeare’s History Plays. London: Chatto & Windus, 1944. 1 Antonio Ballesteros González, ed., Eduardo III, Madrid, Asociación de Directores de Escena de España, 2005. 2 Giorgio Melchiori, ed., Teatro completo di William Shakespeare, IX. I drammi storici, vol. III, Roma, 1991. 3 Giorgio Melchiori, ed., King Edward III, The New Cambridge Shakespeare, Cambridge, Cambridge University Press, 1998. All references are to this edition. 4 Eric Sams, ed., Shakespeare’s ‘Edward III’, New Haven, Yale University Press, 1996. 5 His conclusions are yet to appear in book form. See http://content.time.com/time/arts/article/0,8599,1930971,00.html and http://nq.oxfordjournals.org/content/56/4/549.full (accessed 21 September, 2013). 6 For an account of the Bucharest production, see Richard Proudfoot and Richard Volceanov in this volume. 7 Giorgio Melchiori, Shakespeare’s Garter Plays: Edward III to Merry Wives of Windsor, Newark, University of Delaware Press, 1994; Richard Proudfoot, “The Reign of King Richard III and Shakespeare”, Proceedings of the British Academy, vol. 71, 1985, pp. 159-185; E. M. W. Tillyard, Shakespeare’s History Plays, London, Chatto & Windus, 1944. 8 Jan Kott, Shakespeare Our Contemporary, 1964, London, Routledge, 1988, p. 9. 9 Juan Antonio Hormigón, “Un reto apasionante: Eduardo III de Shakespeare”, ADE Teatro, vol. 107, October 2005, pp. 20-42, quote p. 22. All translations from Spanish are mine. 10 Notice the visual power evoked by these lines. 11 Juan Antonio Hormigón, “Un reto apasionante: Eduardo III de Shakespeare”, p. 34.
mis à jour le : 08/12/2013. Dr. Antonio Ballesteros-González is the author of Narciso y el doble en la literatura fantástica victoriana (Narcissus and the Double in Victorian Fantasy. Cuenca, 1998), “Vampire Chronicle”: Historia natural del vampiro en la literatura anglosajona (“Vampire Chronicle”: A Natural History of the Vampire in English Literature. Zaragoza, 2000), Historia de la serenidad (A History of Serenity. Madrid, 2000), and Escrito por brujas. Lo sobrenatural en la vida y la literatura de grandes mujeres del siglo XIX (Written by Witches. The Supernatural in the Lives and Literature of Great Women of the Nineteenth Century. Madrid, 2005). He has also published more than one hundred articles, book chapters and reviews, and has edited and translated works by Shakespeare, Christopher Marlowe, John Ford, Aphra Behn, William Congreve, Henry Fielding, Mary Shelley, Oscar Wilde, Joseph Conrad and William Faulkner. He has co-edited collective volumes on avant-garde drama, comics and popular texts in English. 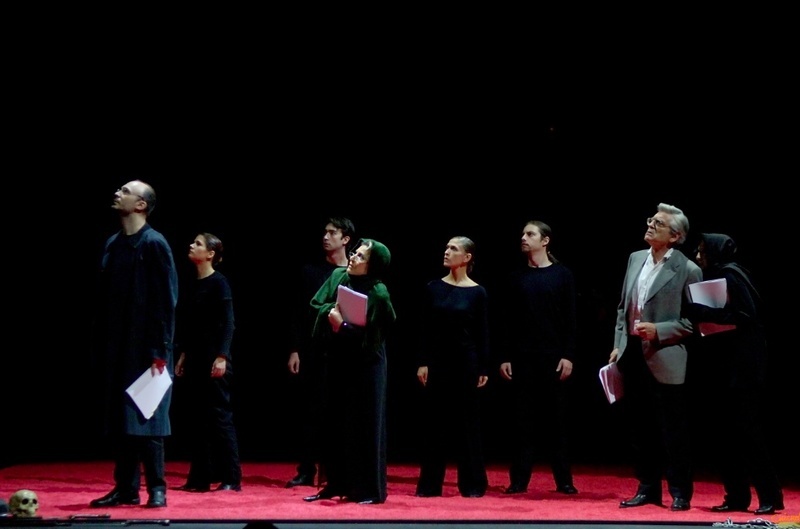 He was awarded the “María Martínez Sierra Prize of Literary Translation”, given by the Spanish Association of Stage Directors (ADE), for his edition of Shakespeare's Edward III (2005). He has taught at several Spanish universities (Complutense de Madrid, Autónoma de Madrid, Castilla-La Mancha at Ciudad Real and UNED), and has delivered more than one hundred lectures and papers at universities and academic institutions both in Spain and abroad. Some of his main fields of academic interest are English Renaissace and Restoration drama, Gothic and fantasy literature, Romantic poetry, Victorian narratives, the Neo-Victorian, Popular Culture, Comparative Literature, and Literary Theory. He is presently Professor of English Literature at the UNED (Universidad Nacional de Educación a Distancia), Spain.